The Rane Model SM26S Splitter Mixer is one of the most versatile audio products available. In its basic configuration, it is a six-to-two line-level mixer. It will accept six balanced or unbalanced line level inputs which are applied to six Level and Pan controls. 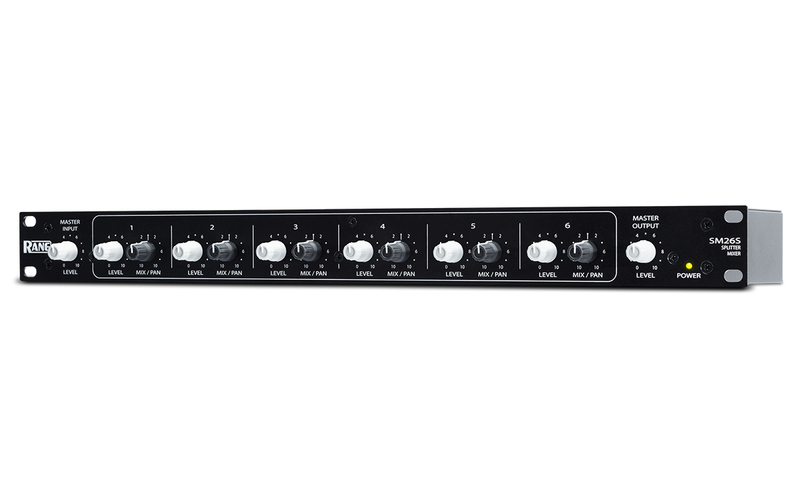 An additional stereo Master Input allows a total of eight inputs. The result of the mix is sent to an overall Master Output Level control and appears at the Left and Right Outputs on the rear. In splitter mode, the SM26S can take one or two line level inputs and split these to any of the six Mono Outputs. The Mix/Pan controls in this mode control the level from each of the two input buses to be applied to each Output. Internal header blocks allow the Mix Outputs to become an independent stereo out, allowing a total of eight outputs. The SM26S may also be used as a six input, six output buffer amplifier - in which case signal applied to Input 1 is delivered to Output 1, and so on. The SM26S may also be used in a combination of modes at once. For instance, Inputs 1 through 3 may be mixed to the left and/or right output buses, while at the same time Outputs 4 and 5 are delivering signal originally applied to the Left and Right Master Inputs, while at the same time Output 6 is being driven from Input 6 in the straight through mode. 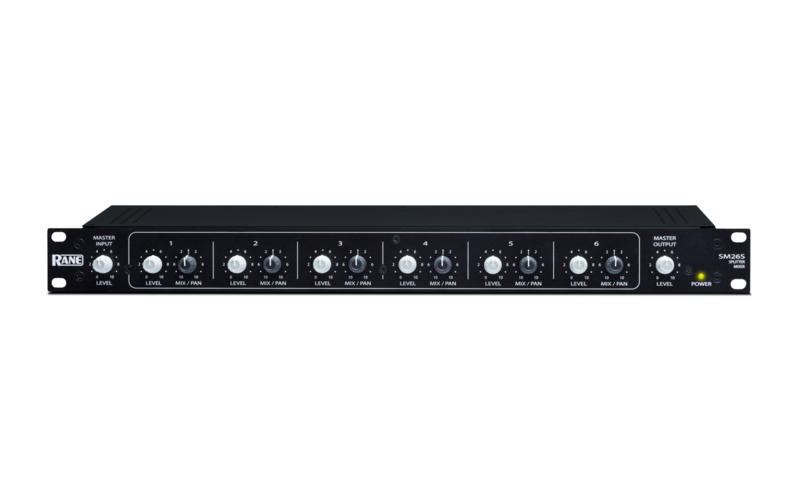 The front of the SM26S comprises a Master Input Level control, six Channel Level controls, six Mix/Pan controls and a Master Output Level control. 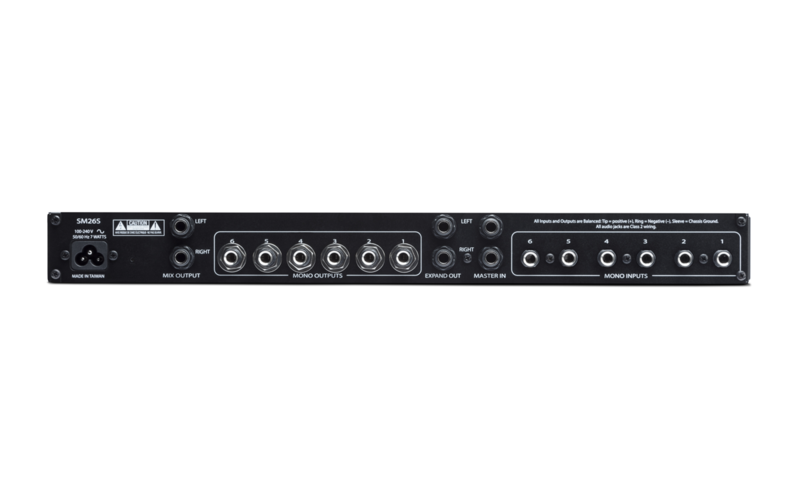 The rear of the SM26S provides two Master Left and Right Inputs, six Mono Inputs, six Mono Outputs and two Master Left and Right Mix Outputs. All Inputs and Outputs on the SM26S are 1/4" TRS active balanced. 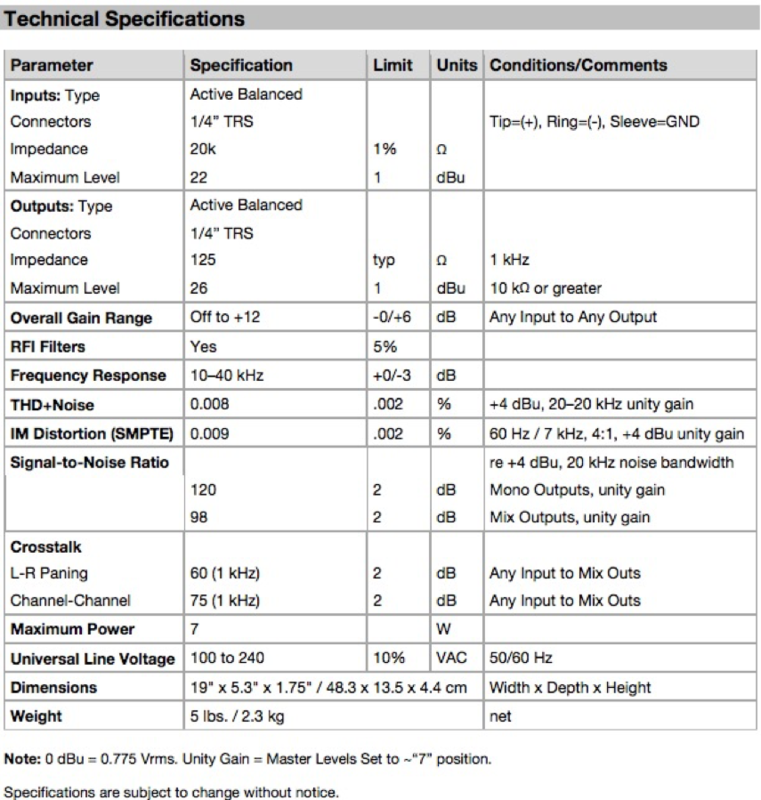 The SM26S capabilities also include a wide variety of functions such as live recording splitting, -10 dBV to +4 dBm level matching, intercom splitting, line boosting, hotel and club zone management, restaurant paging systems, adding additional monitor buses for studio or stage use, and many more custom applications.